Pennypackers started as a food truck, but now has a brick and mortar restaurant in Magoun Square. I tried a sample of their porchetta sandwich at a food truck festival and ready enjoyed it. Leslie and I needed lunch to fuel our day of binge-watching Orphan Black (excellent show, I’d highly recommend it) so we procured a porchetta sandwich ($8) and a BLT ($7). The porchetta came with a choice of grape mostarda or pickled peaches. I had the grape the first time, so I opted for of the peaches. 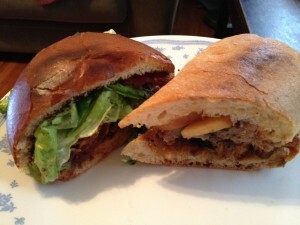 The sandwich was delicious; the pork was tender and flavorful, and pieces of crispy pork skin, tucked in. I liked the acid/sweetness of the pickled peaches. I will return again and again for the porchetta. I think the BLT was only ok. It had a charred tomato relish instead of fresh tomato. I understand doing that in the dead of winter, but why in August, when there is a bounty of fresh, plump tomatoes that taste of summer?